The Pizza Bible - The first crust is a bust! So I've survived long enough on frozen pizza. Being a Chicago boy, that's a shame. I recently bought a Lodge 12" cast-iron skillet and The Pizza Bible. Surprisingly, the Chicago style cast-iron skillet pizza jumped out at me! I've always wanted to get into cooking and recently got a stand mixer as well. I made the dough, measuring all by weight and let it rise for the full 48 hours and proceeded to make my pizza last night. I pressed it into the pan about 3/8"-1/2" thick on the bottom and up the walls of the skillet. 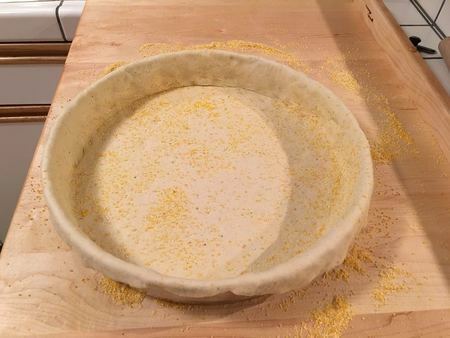 Upon par-baking the crust, it immediately puffed up. I took it out after 12 or so minutes and found Focaccia instead of pizza crust (over an inch thick)!! What could have gone wrong? (again, I'm totally new to this cooking thing). I'm now in Utah at about 5,500 ft elevation if that makes a difference?? 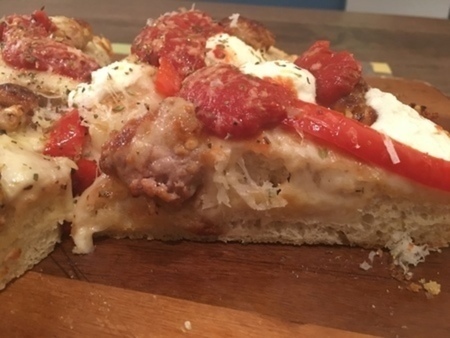 The time I made a cast-iron pizza it had a thicker, more “bready" crust. I’m assuming this is as intended for this style. 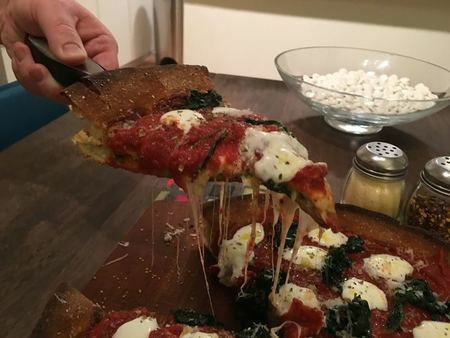 When I’ve used the same deep dish dough and rolled it out to a 17” round for a spinach and ricotta deep dish, the dough is much thinner and more like a traditional pizza crust. Here are some pics from my cast-iron skillet and deep dish pizzas that both used the same dough. Anyway, the picture in the book looks like the cast iron skillet dough is 1/4"-1/2" thick. Mine cooked to about 1-1/4" thick. I ate a little with some olive oil and black pepper but ended up throwing it out. BTW, also wanted to add that I was using Heckers flour per the Chicago dough recipe. I used Ceresota flour. I’ll admit my least favorite pizza (still liked it) of all the ones I made was the cast iron skillet. I commented afterwards it was a little too bready for me. I way prefer a regular deep dish, New York, Detroit, or Sicilian. I’ve made most styles in the book now with much success. Keep at it!! Worry not Tim! Most first tries aren't stellar. At least mine wasn't. :-) Keep at it and your pizzas will get better it no time. Regarding altitude.. it is a factor, but I'm not entirely sure how it affects baking specifically since it's not something I've dealt with firsthand. So, it looks like you're using Ceresota which is a great flour for the style you're learning. As far as equipment goes, it sounds like you've got a scale. Are you measuring in grams (as opposed to ounces)? The other question is are you using a stone/steel and letting your oven heat up for at least an hour? This part is pretty important. Also, another thing I recommend is double checking your numbers for the ingredient amounts/weights. Even after making pizzas for years, it's still pretty easy to happen. And one last question, what was the weight of the dough ball you used for the 12" skillet? Hi Raj. 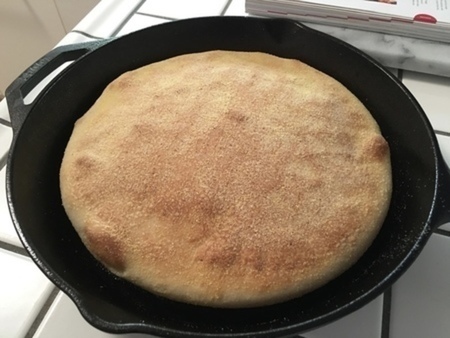 I just looked at the recipe(s) again and discovered that I used 770 grams per the last paragraph of the Chicago Deep-Dish Dough recipe, NOT the 625 grams of the Cast-Iron Skillet recipe! Would an extra 5 oz/145 grams dough make it rise that much? Maybe I should have pressed it out thinner? I let the oven preheat... almost an hour (45-50 min). My dough was already at 55 degrees so I went for it. The oven had two pizza stones, per the book. I measured everything in grams with a MyWeigh KD-8000 or American Weigh AMW-500 palm scale. Lastly, what I've recently read about altitude as it relates to cooking and being an industrial refrigeration plant operator (pressure and temperature are related), higher altitude means less air pressure. That causes water to boil sooner as there is less pressure on water molecules. Water here in Utah (5,500 ft for me) boils around 205 degrees. As such water and other liquids evaporate faster and boil at lower temperatures and leavening gases in breads and cakes expand more quickly. I will keep going. I love pizza too much to stop!